YUM!!! This meal was so easy and so tasty! Great for kids because they can personalize it themselves and it would be great for meal prepping too. 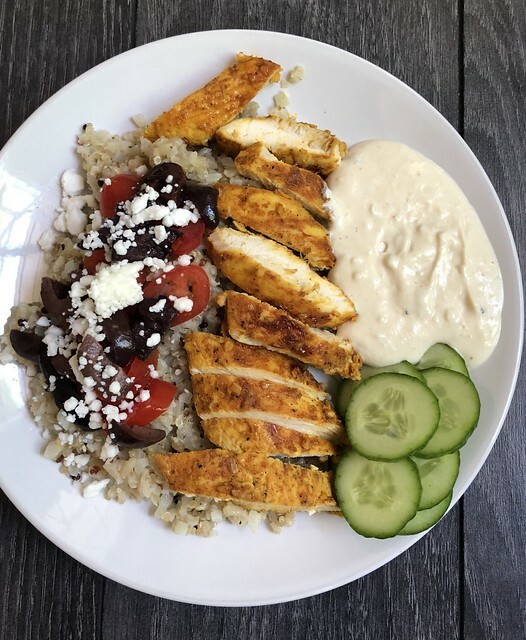 The main recipe below is from Skinnytaste, but I used Mel's Kitchen Cafe's hummus/yogurt recipe (it is our go-to all the time!). I served ours with pita bread (for the kids) and with a mix of quinoa and cauliflower-rice for Mike and I. Plus topping choices of cucumbers, tomatoes, kalamata olives and feta cheese. A definite hit in our house! Over medium-high heat, grill the chicken for 3 minutes or until it no longer sticks to the grill. Turn the chicken and grill an additional 3-4 minutes. Allow the chicken to rest for 5 minutes then slice it thinly, across the grain. Top each breast with 2 tablespoons sauce and a sprinkle of parsley.